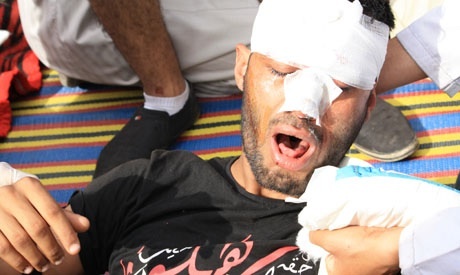 Egypt's Ministry of Health has reported 296 injured in Friday clashes between protesters and military police in front of the Ministry of Defence, as the army gain control of Abbasiya Square after clearing the sit-in and pushing fleeing protesters back towards Tahrir. Around 30 APC vehicles are now stationed on the Salah Salem freeway entrance to the square, guarding the military headquarters. According to Ahram Online reporter on the scene, gunshots were heard in the vicinity of El-Nour Mosque south of Abbasiya, Friday evening. However, it is unclear who was firing the weapons. Demonstrators also report gunfire in the Ghamra area via social media platforms, claiming that the protesters were being ambushed. Meanwhile, the Muslim Brotherhood confirmed on their official twitter account "Ikhwanweb" that none of its members are currently in the Abbasiya area. The Brotherhood, the country's largest political force, also denied any involvement in the ongoing clashes between protestors and the Military police, and called for restraint. Earlier, Al-Hayat 2 Satellite TV showed footage of long range tear gas reportedly being fired by military police into crowds, which cleared pushed the protesters away from the defence ministry. At around 4.30pm, April 6 Youth Movement ,one of the groups that were participating in the "Final Friday" marches to the military headquarters, announced they were withdrawing from the area. The official spokesperson of the movement, Mahmoud Afifi, stated on Twitter that April 6 were leaving "to prevent further bloodshed" and asked all the other protesters to exit the scene as well. At the same time, Egyptian Democracy Now correspondent Sharif Kouddous in the field tweeted that he could hear gunfire and could see a military helicopter flying overhead which the "crowd curse at". Al-Jazeera Arabic TV screened footage showing protesters lighting fires to counteract the effects of the tear gas. The Ministry of Health announced that it had sent tens of ambulances to the area, to cope with the mounting injuries. Earlier, outside of the Ministry of Defence, Ahram online Journalist reported sounds of live ammunition and that many of the injured, who were being ferried from the frontline to safety on motorcycles, were bleeding from their faces. Nile News state TV filmed injured military police being carried off the scene. Nile News also showed footage of a number of individuals sheltering inside the walls of Ain Shams University and throwing stones. Egypt's military police began firing water cannons on protesters at 3:30pm Friday, after thousands-strong marches reached the army headquarters, in protest of the ruling military council. Protesters responded with stones as clashes broke out. Military police personnel were filmed on Nile state TV beating demonstrators with their batons. However, it is still unclear how the fighting started. The clashes between protesters and military police come after a Thursday press conference held by the Supreme Council of the Armed Forces (SCAF) who warned people against protesting in front of military facilities, asking people instead to stay in Tahrir Square. Some people may think their lives were better under Mubarak's rule. all of these unnecessary violent protests are only hurting the economy.... at this point they're doing more damage than good.